Ginger (also known as Zingiber officinale, family: Zingiberaceae) has been widely consumed as a dietary spice, delicacy, and as a traditional oriental medicine. The rhizome can be used fresh, dried or powdered. Ginger is often applied for treating nausea due to caused by morning sickness during pregnancy, chemotherapy and seasickness. The ginger rhizome also contains several biologically active compounds such as gingerol, shogaols, gingerdiol and gingerdione . Typical recommended dosage by manufacturers is around 2.000 mg daily (some even higher; 4.000 mg daily) which is close to the upper dose range (500 mg to 3 g daily) used in clinical trials for blood glucose management. Lower doses, around 1.000 mg are used in clinical trials evaluating effects on testosterone levels. Ginger rhizome powder was reported to posses an antioxidant and androgenic activity in doses of 50 mg/kg and 100 mg/kg daily . Ginger administration significantly increased serum testosterone levels at 100 mg/kg . There was also an increases in testosterone at 50 mg/kg daily but it failed to reach statistical significance . A study by Kamtchouing et al. also reported significantly increased serum and testicular testosterone levels as well as increase in weight of the testis and testicular cholesterol level in healthy rats. Another study using doses of 500 mg/kg and 1000 mg/kg indicated that extract of Zingiber officinale possesses pro-fertility properties . Compared with the controls there was a dose and duration dependent increases in the serum testosterone levels and seminal quality . At a very high dose (2000 mg/kg for 35 days), ginger led to slightly reduced weights of testes which might be due to negative feedback reaction from androgenic activity . Combination of ginger and zinc appears to further increase testosterone in rats . Ginger also prevented damage to reproductive organs induced by aluminium chloride  as well as cisplatin induced testicular damage . Morakinyo et al. , Khaki et al. and Shalaby et al. concluded that ginger may be promising in enhancing healthy sperm parameters. One preliminary study by researchers from Tikrit University showed high statistically significant increase of serum hormones (p< 0.01) in infertile men . After 30 week treatment serum testosterone has increased by 17,7%, serum luteinizing hormone by 43,2% and serum follicle-stimulating hormone by 17,6%; dosage of ginger used was not disclosed . It is suggested that improved testosterone production is because ginger was shown to be effective in decreasing SDF (sperm DNA Fragmentation) in infertile men . SDF is negatively correlated with testosterone levels . This study  also reported significantly increased glutathione levels. Glutathion has been shown to have a synergetic effect with l-citrulline as their combination further increases nitrate and nitrite levels and contributes to the sustained release of NO. While some previous studies have indicated that glutathione stimulates L-arginine turnover and increases nitric oxide synthase (NOS). A study published in 2016 , evaluated effects of 10 mg/kg/day of ginger extract for six weeks on endurance training. Study reported that training in combination with extract significantly increases testosterone while it also significantly decreases cortisol. Oral ginger was reported to accelerate gastric emptying and stimulate gastric motility (spontaneous movements of the stomach that aid in digestion). Most studies report some beneficial effect on gastric emptying time but mostly during some sort of disease state [10,11]. In healthy individuals ginger also seems to increase gastric emptying via antral contraction stimulation . However, Phillips and colleagues  reported that ginger is not associated with an effect on gastric emptying. 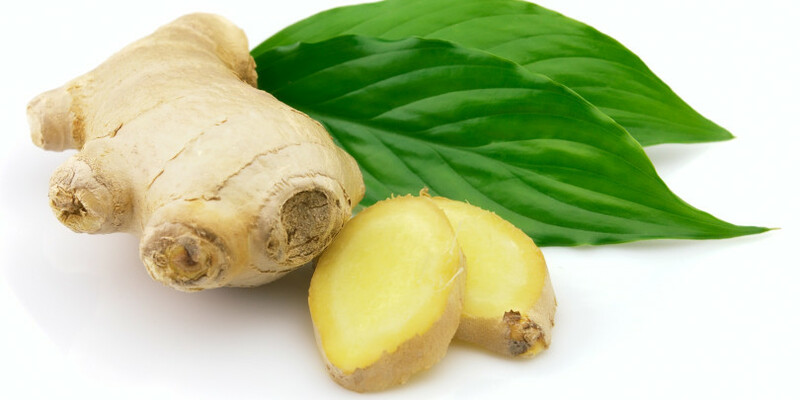 In animals, ginger and its active constituent -Gingerol were reported to enhance gastrointestinal tract transit . Studies are repeatedly showing that ginger extract (at doses ranging from 1.000 to 2.000 mg) reduces serum fasting glucose [26,27]. It also improves insulin sensitivity . In high-fat high-furctose fed rats, ginger neutralized diet induced impairment in glucose regulation, dyslipidemia, and oxidative stress . This observed anti-diabetic activity of ginger powder is credited to two active components: 6-paradol and 6-shogaol . They both exhibit potent activity in stimulating glucose utilization by 3T3-L1 adipocytes and C2C12 myotubes. In the high-fat diet mouse model, 6-paradol decreased blood glucose, cholesterol and body weight. Although 6-paradol is only a minor constituent of ginger, mainly formed from 6-gingerol via 6-shogaol, 6-shogaol was reported to be almost completely metabolized into 6-paradol in mice . A meta-analysis of nine randomized controlled trials  evaluated effects of ginger on net changes in blood glucose and lipid concentrations (total cholesterol, triglyceride, low-density lipoprotein cholesterol, high density lipoprotein cholesterol). In a total of 609 adults with T2DM or hyperlipidemia, ginger supplementation led to significant reductions in plasma levels of total cholesterol, triglycerides, and blood glucose, but non-significant reduction in LDL-c levels. According to studies by Srivastava  and Thomson et al. ginger can be used as natural antithrombotic agent. Ginger has also been recorded as useful remedy in preventing post-operative nausea and vomiting in humans  as well as preventing morning sickness during pregnancy . At high doses (500 mg/kg) aqueous extract of ginger exhibits cholesterol-lowering effect . Ginger is also often found in joint support supplements. There is little well-designed research, however, ginger was reported to have some effectiveness for relieving joint pain of osteoarthritis (OA) and rheumatoid arthritis probably due to its anti-inflammatory [17,18,21] and anti-oxidant activity [17,18]. In a meta-analysis of five trials (593 patients) ginger was found to be modestly efficacious and reasonably safe for treatment of OA and was able to reduce pain and disability . Ginger is considered a safe herbal medicine with only few and insignificant adverse/side effects . Some minor adverse effects such as mild diarrhea have been associated with the use of ginger in humans . Ginger may also cause heartburn and at much higher doses act as a gastric irritant . One study carried out on male diabetic rats concluded that extracts of Zingiber officinale have high safety and intake of Zingiber officinale roots as a drink may be useful for diabetic patients who suffer from sexual impotency . A 16 day administration of 1000 mg of powdered rhizome of Zingiber officinale appears to have no side effects . Warning: Ginger may possibly affect fibrinolytic activity, therefore patients taking anti-coagulant drugs are suggested to take precaution . Khaki, Arash, et al. “The effects of Ginger on spermatogenesis and sperm parameters of rat.” Iranian Journal of Reproductive Medicine 7.1 (2009): 7-12. Kamtchouing, Pierre, et al. “Evaluation of androgenic activity of Zingiber officinale and Pentadiplandra brazzeana in male rats.” Asian journal of andrology 4.4 (2002): 299-302. Morakinyo, A. O., O. S. Adeniyi, and A. P. Arikawe. “Effects of Zingiber officinale on reproductive functions in the male rat.” African Journal of Biomedical Research 11.3 (2008). Rong, Xianglu, et al. “A 35-day gavage safety assessment of ginger in rats.” Regulatory Toxicology and Pharmacology 54.2 (2009): 118-123. Moselhy, W. A., et al. “Role of ginger against the reproductive toxicity of aluminium chloride in albino male rats.” Reproduction in Domestic Animals 47.2 (2012): 335-343. Amin, Amr, et al. “Herbal extracts counteract cisplatin‐mediated cell death in rat testis.” Asian journal of andrology 10.2 (2008): 291-297. Shalaby, M. A., and Samar M. Mouneir. “Effect of zingiber officinale roots and cinnamon zeylanicum bark on fertility of male diabetic rats.” Global Veterinaria 5.6 (2010): 341-347. Stewart, J. J., et al. “Effects of ginger on motion sickness susceptibility and gastric function.” Pharmacology 42.2 (1991): 111-120. Shariatpanahi, Zahra Vahdat, et al. “Ginger extract reduces delayed gastric emptying and nosocomial pneumonia in adult respiratory distress syndrome patients hospitalized in an intensive care unit.” Journal of critical care 25.4 (2010): 647-650. Wu, Keng-Liang, et al. “Effects of ginger on gastric emptying and motility in healthy humans.” European journal of gastroenterology & hepatology 20.5 (2008): 436-440. Phillips, S., S. Hutchinson, and R. Ruggier. “Zingiber officinale does not affect gastric emptying rate.” Anaesthesia 48.5 (1993): 393-395. Yamahara, Johji, et al. “Gastrointestinal motility enhancing effect of ginger and its active constituents.” Chemical & pharmaceutical bulletin 38.2 (1990): 430. Srivastava, K. C. “Aqueous extracts of onion, garlic and ginger inhibit platelet aggregation and alter arachidonic acid metabolism.” Biomedica biochimica acta 43.8-9 (1984): S335. Mohammadbeigi, Robabeh, et al. “Comparing the effects of ginger and metoclopramide on the treatment of pregnancy nausea.” Pakistan journal of biological sciences: PJBS 14.16 (2011): 817. Ramadan, Gamal, Mohammed Ali Al-Kahtani, and Wael Mohamed El-Sayed. “Anti-inflammatory and anti-oxidant properties of Curcuma longa (Turmeric) versus Zingiber officinale (Ginger) rhizomes in rat adjuvant-induced arthritis.” Inflammation 34.4 (2011): 291-301. Wigler, I., et al. “The effects of Zintona EC (a ginger extract) on symptomatic gonarthritis.” Osteoarthritis and cartilage 11.11 (2003): 783-789. Ali, Badreldin H., et al. “Some phytochemical, pharmacological and toxicological properties of ginger ( Zingiber officinale Roscoe): A review of recent research.” Food and chemical Toxicology 46.2 (2008): 409-420. Shalaby, M. A., and A. R. Hamowieh. “Safety and efficacy of Zingiber officinale roots on fertility of male diabetic rats.” Food and Chemical Toxicology 48.10 (2010): 2920-2924. Thomson, M., et al. “The use of ginger (Zingiber officinale Rosc.) as a potential anti-inflammatory and antithrombotic agent.” Prostaglandins, leukotrienes and essential fatty acids 67.6 (2002): 475-478. Hosseini, Jalil, et al. “The influence of ginger (Zingiber officinale) on human sperm quality and DNA fragmentation: A double-blind randomized clinical trial.” International Journal of Reproductive BioMedicine 14.8 (2016): 533. Wdowiak, Artur, et al. “Levels of FSH, LH and testosterone, and sperm DNA fragmentation.” Neuroendocrinology Letters 35.1 (2014): 73-79. Busman, Hendri, and Mohammad Kanedi. “Testicular Function of Rats Treated with Water Extract of Red Ginger (Zingiber officinale var. rubrum) Combined with Zinc.” Journal of Food and Nutrition Research 4.3 (2016): 157-162. Barari, Ali Reza, and Saeed Shirali. “Endurance training and ginger supplement on TSH, T3, T4, testosterone and cortisol hormone in obese men.” Persian Journal of Medical Sciences (PJMS) 3.1 (2016). Imani, Hossein, et al. “Effects of ginger on serum glucose, advanced glycation end products, and inflammation in peritoneal dialysis patients.” Nutrition 31.5 (2015): 703-707. Mahluji, Sepide, et al. “Effects of ginger (Zingiber officinale) on plasma glucose level, HbA1c and insulin sensitivity in type 2 diabetic patients.” International journal of food sciences and nutrition 64.6 (2013): 682-686. Saravanan, Natarajan, et al. “Dietary ginger improves glucose dysregulation in a long-term high-fat high-fructose fed prediabetic rat model.” (2017). Wei, Chien-Kei, et al. “6-Paradol and 6-Shogaol, the Pungent Compounds of Ginger, Promote Glucose Utilization in Adipocytes and Myotubes, and 6-Paradol Reduces Blood Glucose in High-Fat Diet-Fed Mice.” International Journal of Molecular Sciences 18.1 (2017): 168. Chen, Huadong, et al. “Metabolism of -shogaol in mice and in cancer cells.” Drug Metabolism and Disposition 40.4 (2012): 742-753. Jafarnejad, Sadegh, et al. “Effect of ginger (Zingiber officinale) on blood glucose and lipid concentrations in diabetic and hyperlipidemic subjects: A meta-analysis of randomized controlled trials.” Journal of Functional Foods 29 (2017): 127-134. Bartels, E. M., et al. “Efficacy and safety of ginger in osteoarthritis patients: a meta-analysis of randomized placebo-controlled trials.” Osteoarthritis and cartilage 23.1 (2015): 13-21.